The Horatio Alger Association of Distinguished Americans, Inc. will honor twelve outstanding individuals at the 65th annual Horatio Alger Awards Ceremonies in April. 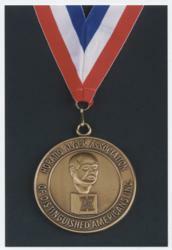 The Horatio Alger Award Medallion is given to each Awardee. The Horatio Alger Association of Distinguished Americans, Inc. is honored to welcome the 2012 Horatio Alger Award winners at the 65th annual Horatio Alger Awards Ceremony on April 13th in Washington D.C. The Award is given annually to exceptional individuals in our society who, through courage and dedication, overcame the difficult circumstances they faced early in life and accomplished their goals. The Award is also a salute to these individuals’ philanthropic endeavors in their communities, nationally, and internationally. In receiving the Horatio Alger Award, the twelve recipients will become Lifetime Members and will join the Association’s current Membership in working to provide deserving high school seniors with the financial resources and mentorship they need to pursue a college degree. John H. Weiland, President, Chief Operating Officer and Director, C.R. Bard, Inc.
Clarence L. Werner, Founder and Chairman Emeritus, Werner Enterprises, Inc.
Additionally, the Norman Vincent Peale Award will be given to Dennis R. Washington, Founder of the Washington Companies. The Award is annually bestowed on a member who has made exceptional humanitarian contributions to society, who has been an active participant in the association, and who continues to exhibit courage, tenacity and integrity in the face of great challenges. Founded in 1947, the Horatio Alger Association of Distinguished Americans celebrates those individuals in our society whose determination and hard work enabled them to overcome life’s obstacles to achieve success. As a 501 (c) (3) education non-profit, the Association provides scholarships and mentorship to high school seniors who have demonstrated courage in the face of adversity and an unwavering desire to pursue a higher education. The Horatio Alger Association has awarded more than $90 million in scholarships since the inception of its scholarship programs in 1984. For more information, please visit http://www.horatioalger.org.